The search for lost cities is what movies are made of — and many of the films were inspired by real life. A number of authors have set out following the trails and clues left by others in search of what may still be lost. The latest is thriller writer Douglas Preston‘s book The Lost City of the Monkey God. Rumors of the White City hidden in the impenetrable jungles of Honduras have persisted for centuries. Preston joined a team of explorers and archaeologists, using a combination new technology and old-fashioned fight-your-way-through-the-jungle, to search for lost ruins. Indeed, they find a lost city and indications of others. This a true story of adventure into a land of deadly animals and diseases, cartels and fixers, and forgotten histories that may still hold messages for modern man. As Preston and the authors below have shown us, there is still much of our past to be uncovered. And there are still adventures to be had. In my review of travel adventure books, we have searched for Sheba and explorers of the New World. We have also disappeared into the jungles of Latin America on the trail of lost cities. Now we will return to uncovering the ancient world. Mark Adams set a benchmark for travel adventure lit with his Turn Right at Machu Picchu. This fish-out-of-water follows the trail of legendary explorer Hiram Bingham who brought Machu Picchu, the hidden Inca mountain refuge, to the world’s attention. A perfect combination of Adams’ travails and history — every bit a page turner as a novel. Adams followed this adventure up with Meet Me in Atlantis. Here he tries to hunt down the true experts of the legendary lost city, among a field known for, how should I put it, fringe thinkers. His hunt leads to many possibilities, and even though not as much adventuring as his first book, it is a refreshing change to the libraries full of bizarre Atlantis speculations. The busyness of the Christmas season has become nearly a tradition itself. Many are bogged down in the Retail Apocalypse right to the last hours of Christmas Eve. Stores will do anything to get in you in the door and our leaders will smile at the minor economic bump and run and hide when it’s erased with post-holiday debt. Nevertheless, perhaps you’re like me and try to carve some time out of these weeks to tone it down a bit. Perhaps you’d like to go on an adventure? Disappear into the jungles searching for lost cities like Indiana Jones? No, seriously, you can for only a few dollars. In The Lost City of Z, you can follow the trail of legendary explorer Percy Fawcett. In 1925, he disappeared into the Amazon looking for the fabled city. When you’re done, head to Honduras in Jungleland and search for Ciudad Blanca — perhaps the fabled El Dorado. Then head back down south and follow the footsteps of Hiram Bingham and explore Machu Picchu in Cradle of Gold. So take a breath, turn the lights down, and vanish into another world. Exploring the final frontier has never been easy. For decades, in fits an spurts, we have explored the Solar System and established manned outposts in orbit. We even reached the Moon, which has been so long ago now, that it seems a dream. We can probably blame the tortoise pace of space exploration on it being largely controlled by the government and their ever changing, and short-sighted, whims. In recent years, private companies have taken up the torch. As witnessed by this week’s crash of the spacecraft Galactic, exploration on the edge of frontiers is still fraught with danger. It always has been and always will be. When the New World was being rediscovered by Europeans from 1492 on, it was much the same. Driven by politics, economics and the innate desire of humans to explore, not all went well. The early voyages were often about finding wealth and conquering lands. Later, though, it would be about building a better life, improving the human condition. The powerful desire to improve the existence of one’s family and future descendents has long been entwined with that frontier spirit. It’s often difficult to tell them apart. Interestingly enough, we would later learn that 1492 wasn’t the first rediscovery of what would later be named the Americas. In 1000 A.D., the Vikings arrived in North America. It seemed almost inevitable that these quintessential seafarers and explorers would do just that. For centuries the sagas and rumors attesting to their arrival was largely discarded as myth. Then archaeological remains of a settlement were found in Canada in 1960. Still, the idea of pre-Columbus explorers was seen as unlikely and supposed accounts quickly dismissed. This was for two reasons: One, the level of required verified evidence is high. Is it too high? The Viking sagas told of exploring America, but were dismissed as legend. Even now, the extent of their exploration is unknown, but it is admitted that they voyaged to the coast for decades, if not longer. Only one settlement? These legendary warriors never ventured far from the beaches? Two, early attempts to dismiss all natives as not much more than primitive cavemen saw many people ascribe anything of sophistication to foreign visitors. We now know the New World was replete with civilization and we know they arrived here longer ago than originally thought, through multiple paths. That paradigm shift has led many to wonder: Is it reasonable to think that people here for so long remained isolated from the rest world? A world that had many accomplished seafarers? After all, didn’t the natives make it here at one point? Does any civilization live in isolation for over 10,000 years? Of course, there are those who consider any suggestion of diffusion racist. They are driven by those who have, or still do, see natives as inferior. The other side of the coin are those who believe it did happen, repeatedly, and assert that it’s racist to say it couldn’t have happened. So much for academic inquiry. To be certain, the field has been full of fringe writers pushing many a bizarre theory or those motivated by ideology. Not all are so driven. Many are simply looking for the facts, some of which have always hidden in plain sight. Sometimes it was intention, other times apparent chance, but in either case exploration burned in the souls of many men and women. What resulted wasn’t always good, but the overall condition of man usually improved. Does the fire of exploration still kindle? Are we too busy to see past tomorrow, buried in our televisions and self-created busyness? Time will tell if humans will quit ignoring the calls to be something greater than what is pushed upon them. Modern steps into space are part of a long legacy that reaches back millennia. The crash of the Galactic won’t extinguish the flame. It reminds us there are still those in which the fire still burns. The pyramids of Giza. The last of the Seven Wonders of the World. They have spawned endless speculation into the methods of their construction and purpose. Much of it bizarre: Aliens built it. It’s a power plant. A weapon. Vault of lost knowledge. This all makes for a lot of absurd — I mean interesting — speculation. And occasional fun fiction. In this case, though, fact is far more interesting. 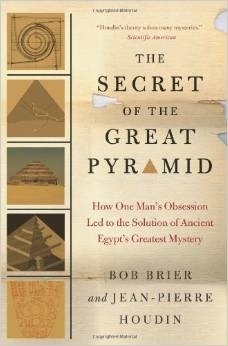 In The Secret of the Great Pyramid, Egyptologist Bob Brier chronicles the quest of architect Jean-Pierre Houdin to unlock the secret of the Great Pyramids assembly. Rather than resorting to stargates and levitation, Houdin looked at it with an eye honed by design and engineering: Moving and raising blocks is physics. No advanced math is needed. No spaceships either. That doesn’t mean it was easy. Realize that Egyptians wrote about nearly everything, except how they built pyramids, which adds even more to their mystique. Brier recounts their history, which began with others before those at Giza. A bit of science, a bit of trial and error. Eventually it was perfected. I won’t reveal the details here, but it seems we may have long been looking for an answer too complicated. Sometimes simple is all that is needed. Perhaps most fascinating is that pyramids came early in Egyptian history rather than later. We continue to learn that the ancients were quite intelligent. Too often we look back and down on those who have faded into history — “chronological snobbery” C.S. Lewis called it. They were smart, just had a different level of technology and knowledge base. Discoveries continue to show that mankind’s intelligence existed very early, if not from the beginning. Our modern nations have existed for an eye-blink in time. Will we approach the longevity of ancient empires? Or will we be crushed under the weight of our misplaced stones? So perhaps the pyramids carry a message after all. Many of you have grown up with fictional characters like Indiana Jones. Swashbuckling tales of danger in search of lost cities. There was a time when such adventures weren’t the realm fiction. In the last decades of the heyday of exploring the last wilds of the Earth, Colonel Percy Fawcett led an expedition into the Amazon to search for the fabled Lost City of Z. Decades of rumors of his fate ensued. Had he found the lost city? Was he living among the natives? Had he succumbed to the jungle many years before? David Grann takes us on a tour of Fawcett’s obsession in The Lost City of Z, in part by heading into the jungle himself following the footsteps of the lost explorer. But Fawcett wasn’t the only one. Theodore Morde had claimed he had found the lost White City in Honduras. He never returned to explore his find and may have tried to obscure its location to dissuade others. Christopher S. Stewart dives into this man’s life in Jungleland. He too goes to the jungle and tries to locate Morde’s discovery and, perhaps, what haunted him to the end. Then there was Hiram Bingham who discovered the legendary mountaintop city of Machu Picchu. This site was not lost and has become an iconic wonder of the Mesoamerican past. Christopher Heaney chronicles Bingham’s quest in Cradle of Gold. The classic journey of that era that has impacted history decades later to our time. Its forgotten history of a sprawling empire is still being revealed. And Machu Picchu has become the prime example of the need to return artifacts to their rightful nations that were acquired (not always honestly) during the age of relic hunting. These books are windows into the bygone era of journeys into the unknown. Sometimes driven by fame or fortune, discovery or quest of knowledge, the explorers were nearly the last of their kind. Perhaps those who have left Earth into space are our only successors to them. In any case, there are still discoveries to be made on our world; jungles that still cling to their secrets and can make men vanish in an eye blink. We are desperately in need of a generation that takes mankind’s history seriously while looking forward and are willing to explore new frontiers and push us beyond new thresholds. Ignoring history, not seeing past tomorrow and thinking a new phone is “innovation” just doesn’t cut it.